Hello again everyone! 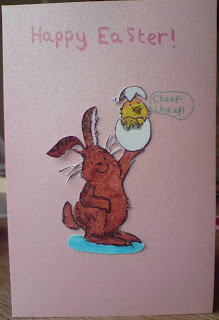 Earlier this week I made another Easter card. My mum was making some birthday cards and that made me and one of my friends want to make cards as well. I made the card down below for her and her family and I hope you all like it. It is a card using a lovely stamped image that I carefully coloured in and then cut out and stuck to the card. After that I just added the words Happy Easter. Hi there lovely daughter of mine, another lovely card. Well done! well done Tiger, it's a lovely card,very sweet.